I don't know about you, but I am having a hard time believing that Valentine's Day is just two days away... which means that Saint Patrick's Day will be here in another month! Even though we usually are on March Break during Saint Patrick's Day, I still like to discuss the holiday with my students before the break, and celebrate a bit! Read on to see my top 5 French Freebies for Saint Patrick's Day! These Saint Patrick's Day-themed 10 frames puzzles are perfect to add to our math centres this time of year. They include numbers 1-20, but I just use 1-10 in maternelle. Students match the ten frames to the correct word and symbol. To make them self-correcting, I stick identical stickers on the backs of the pieces that go together. Peg Swift's products are always beautiful! I like this poster because it discusses traditions (an outcome for maternelle in Nova Scotia), and I really like the section where students fill in why they are chanceux. I usually get my students to discuss and share as a group, and then draw their answers, adding words if they are able. If you follow me on Instagram, you are probably used to seeing my weekly comptine in my Instagram Stories. I think that comptines are so important for teaching vocabulary, sight words, syllables, rhymes, and other important conscience phonologique skills. I plan to use this little rhyme in the weeks before Saint Patrick's Day in my classroom this year. My students love directed drawings, and I love that there are activities to go with the comptine that I don't have to make myself! Lucy at For French Immersion has quality resources for every season and holiday, and the resources she has featured in the above blog post are no exception. There is a free Slideshare about a leprechaun that you can show to your students (en français, of course), and a labeling sheet where they will label the parts of a leprechaun or a Saint Patrick's Day scene. 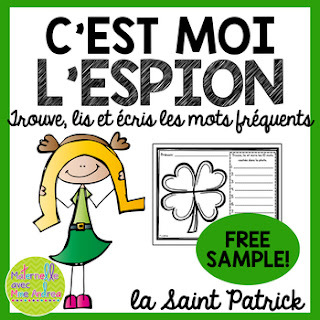 The freebie in my store for Saint Patrick's Day is a sample of a larger "I Spy" worksheet set. My students always love these activities! In each picture, there are hidden words that students have to find, write, and say. The words are super tiny and will need to be found using a magnifying glass. This freebie is for decoding 3-letter words, but I have other (paid) sets for finding letters and sight words, too. If your students enjoy this activity, you can check them all out right here. 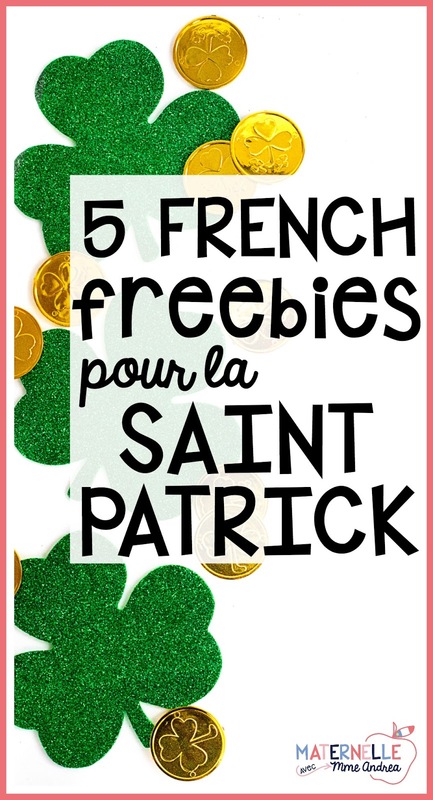 For some reason, I find that free Saint Patrick's Day resources are the hardest to find en français! Hopefully some of these will be helpful to you in your classroom this March.